Wildlife officials in California have thanked a crab fisherman and his five-year-old son for helping them free a humpback whale that had become entangled in some fishing lines off the coast of Carmel Highlands. The fisherman, Calder Deyerle, and his son Miles are credited with spotting the struggling whale, which was dragging heavy crab fishing lines and floats Tuesday morning. The two then contacted authorities, who sent out members of the California Whale Rescue. The father-son team then waited in their boat nearby to show the group the whale's location. The CWA used a pole to try and cut the ropes off the whale, CNN reported. 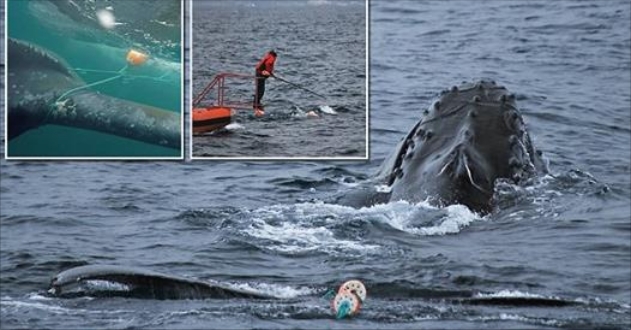 A hook knife was mounted on the pole, and the rescue members chased the whale in a boat trying to cut it free.The rescue operation took seven hours, with the whale repeatedly disappearing underwater, however finally the ropes were cut loose. In a video taken of the rescue, the team can be seen fishing the lines out of the water and celebrating finally setting the whale free. However, according to the CWR, Deyerle's 'willingness to stand by was vital to the success of the event'. Without the fisherman and his son standing by until officials arrived, it would have made locating the whale much more difficult. Entanglements of this kind can lead to eventual amputation of the flukes, and possible death of the animal, according to the CWR. 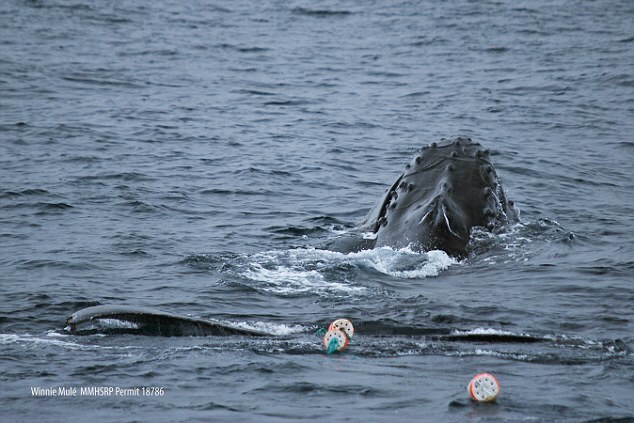 Responses to "Humpback whale freed from tangled fishing lines off California coast"